If you’re just beginning to shop for a video baby monitor, then you’ve probably already realized that there is a wide range of products available. Whether you’re on a budget and just want to buy one with the basic features, or if you want to spend a little more money and get one with all the bells and whistles, there is a video baby monitor for you. Video baby monitors have evolved to the point now where you can actually play back some of the recordings that they take. In the past, you would only be able to watch them live on the screen, and couldn’t take a snapshot or rewind to see the shot again. Now there are some models that offer recording features so you will never miss a moment! One of the most affordable options when it comes to video baby monitors with recording features also happens to be one of the best options. 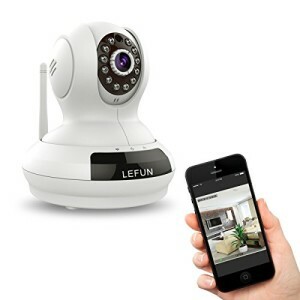 We are talking about the LeFun Wireless WiFi IP Surveillance Camera HD 720P Nanny Cam Video Recording Play/Plug Pan Tilt Remote Motion Detect Alert with Two-Way Audio and Infrared Night Vision. This LeFun video baby monitor allows you to rewind, fast forward and playback using the local micro SD card. You can also enjoy being able to pan, zoom and tilt the camera so you can capture the exact moment that you are looking for. This is especially beneficial when you have a toddler that is starting to move around the room a lot. It basically acts like a surveillance camera that you would find in a store. Of course, you can’t do everything that those types of cameras can do, but for the purposes of watching your baby grow up right before your eyes, it gets the job done. And the best part about it is that it’s not going to break the bank! Who Should Buy a Video Baby Monitor with Recording Features? It may seem like an unnecessary feature to have a video baby monitor with a recording feature, considering most of the time the baby is sleeping when you have the camera on them. But as your baby grows, you will want to let them play in the room by themselves without your supervision to see how they react. That is when it’s a good time to have a video baby monitor with recording features, because you never know what you might miss. Also, if you or your spouse stays at home with your child throughout the day, you may want to have your child’s playtime recorded so the other parent can watch as well. When you have the ability to record with your video baby monitor, you will never have to worry about missing a moment. And the best part about it is that you can share funny or cute moments with others that you may have missed otherwise! Are Video Baby Monitors with Recording Expensive? Just like with any product, including other video baby monitors, there are different price points when it comes to video baby monitors with recording features. You can get some for less than $100, or you could spend a few hundred dollars. It really all depends on what you will be using it for and whether the price is justified. If you want to record your baby sleeping throughout the night, then you will probably need to get a more expensive model to be able to hold that amount of data. But if you’re just looking to capture an occasional moment or two, then you can find a pretty good quality video baby monitor that will do the trick. The question of the worth of a video baby monitor with recording features comes down to what you want it for. Some people absolutely have to have one that records footage, while others don’t think it’s necessary. One thing for certain is that you will never miss a moment to share with others when you have a surveillance camera on your child. It can be hard to have your smartphone out all the time to capture those moments, so a video baby monitor with recording features is a great benefit from that aspect.